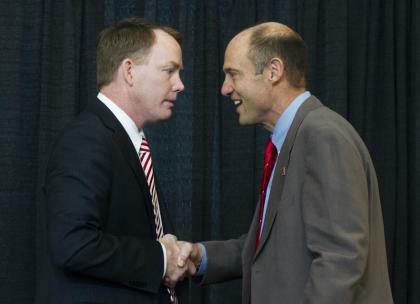 Nebraska has gotten off to a disastrous start in its first year with Mike Riley as head coach. The Huskers dropped to 3-6 overall and 1-4 in Big Ten play with a 55-45 loss at Purdue on Saturday. Purdue’s lead was as big as 42-16 in the third quarter before the Huskers rallied to make the final score somewhat respectable. It was just the second Big Ten win in 20 tries for Purdue during the Darrell Hazell’s three seasons with the program, so the loss was especially ugly for Nebraska. Understandably, the poor start has caused quite a bit of uproar from the Nebraska fanbase with some even calling for Riley to lose his job. As a result, Huskers athletic director Shawn Eichorst issued a statement of support for Riley on Monday morning. Eichorst made the move to fire Bo Pelini and bring in Riley last year even though a Pelini-coached Huskers team had never won fewer than nine games in a season under his watch. The gripe against Pelini was that he never won the big game or got the Huskers over the hump and back into national prominence. Eichorst brought in Riley to do just that and it’s way too early to write him off, no matter how bad this season gets. Nebraska’s first five losses came by a combined total of 13 points (including a Hail Mary against BYU and last-second field goal against Wisconsin), so the team has been competitive in each of its games heading into the Purdue fiasco. But with games against Top 10 opponents Michigan State and Iowa still on the schedule, it looks like a sure bet that the program will have its first losing season since 2007. For more Nebraska news, visit HuskerOnline.com. Sam Cooper is a contributor for the Yahoo Sports blogs. Have a tip? Email him or follow him on Twitter!